But of the times and the seasons, brethren, ye have no need that I write unto you. For yourselves know perfectly that the day of the Lord so cometh as a thief in the night. For when they shall say, Peace and safety; then sudden destruction cometh upon them, as travail upon a woman with child; and they shall not escape. But ye, brethren, are not in darkness, that that day should overtake you as a thief. Ye are all the children of light, and the children of the day: we are not of the night, nor of darkness. Therefore let us not sleep, as do others; but let us watch and be sober. For they that sleep sleep in the night; and they that be drunken are drunken in the night. But let us, who are of the day, be sober, putting on the breastplate of faith and love; and for an helmet, the hope of salvation. "Woe unto you! for ye build the sepulchres of the prophets, and your fathers killed them. Truly ye bear witness that ye allow the deeds of your fathers: for they indeed killed them, and ye build their sepulchres. Therefore also said the wisdom of God, I will send them prophets and apostles, and some of them they shall slay and persecute: That the blood of all the prophets, which was shed from the foundation of the world, may be required of this generation; From the blood of Abel unto the blood of Zacharias which perished between the altar and the temple: verily I say unto you, It shall be required of this generation. Woe unto you, lawyers! For ye have taken away the key of knowledge: ye entered not in yourselves, and them that were entering in ye hindered." And as He said these things unto them, the scribes and the Pharisees began to urge Him vehemently, and to provoke Him to speak of many things: Laying wait for Him, and seeking to catch something out of His mouth, that they might accuse Him. O holy Virgin Anastasia,/ thou didst redden thy robe of purity/ with the blood of thy martyr's contest./ Thou dost illumine the world with the grace of healing/ and intercede with Christ our God for our souls. Thou didst abandon all earthly comforts, O Father Abramius;/ thou didst live righteously in hope of things to come/ and receive a sacred anointing./ Initiated into divine mysteries thou dost enlighten those who cry:/ Glory to Him Who has strengthened thee; glory to Him Who has crowned thee;/ glory to Him Who through thee works healings for all. Bright beacon of purity and Light of Galloway, O holy Kennera,/ as thou didst preserve thyself in virginity for love of Christ,/ pray to Him, that despite our corrupt condition He will grant us great mercy. Rejecting the nobility of thy birth, O Father Colman,/ thou didst seek God in the solitude of desert places./ Thy virtue like a beacon, drew men unto thee/ and thou didst guide them into the way of salvation./ Guide us also by thy prayers, that our souls may be saved. 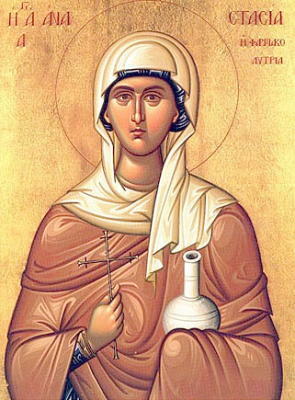 Purified by the streams of thy virginity/ and crowned by the blood of martyrdom,/ thou dost grant healing to those in sickness,/ and salvation to those who lovingly pray to thee./ For Christ has given thee strength which flows to us as a stream of grace,/ O Virgin Martyr Anastasia. Thou didst live on earth as an angel in the flesh/ and flourish as a well planted tree,/ watered by abstinence and tears,/ O Abramius, vessel of the Holy Spirit. neighborhood, to the Christians as a great ascetic and to the pagans as a rare beauty. The pagan administrator of the city, Probus, heard of her and sent soldiers to bring her to him. The good Abbess Sophia counselled Anastasia for two hours on how to keep the Faith, how to resist flattering delusion and how to endure torture. Anastasia said to her: 'My heart is ready to suffer for Christ; my soul is ready to die for my beloved Jesus.' Brought before the governor, Anastasia openly proclaimed her faith in Christ the Lord and, when the governor tried to dissuade her from the Faith, first with promises and then with threats, the holy maiden said to him: 'I am ready to die for my Lord, not once but - oh, if it were only possible! - a thousand times.' When they stripped her naked, to humiliate her, she cried to the judge: 'Whip me and cut at me and beat me; my naked body will be hidden by wounds, and my shame will be covered by my blood!' She was whipped and beaten and cut about. She twice felt a great thirst and asked for water, and a Christian, Cyril, gave her a drink, for which he was blessed by the martyr and beheaded by the pagans. Then her breasts and tongue were cut off, and an angel of God appeared to her and upheld her. She was finally beheaded with the sword outside the city. Blessed Sophia found her body and buried it, and Anastasia was crowned with the wreath of martyrdom under the Emperor Decius (249-251).